Here at Style Chicks, we talk about Retinol a lot. A lot, a lot, a lot. And for good reason, as recently discussed, it treats acne to wrinkles and everything in between. And for all our jabbering about how Retinol can single-handedly do all the things, why do we still think it should be paired with Vitamin C Serum and Hyaluronic Acid? Because Vitamin C and Hyaluronic Acid make Retinol do all the things faster, deeper and better. My Dermatologist recommended using Retinol and Vitamin C daily for optimal collagen production and anti-aging benefits. 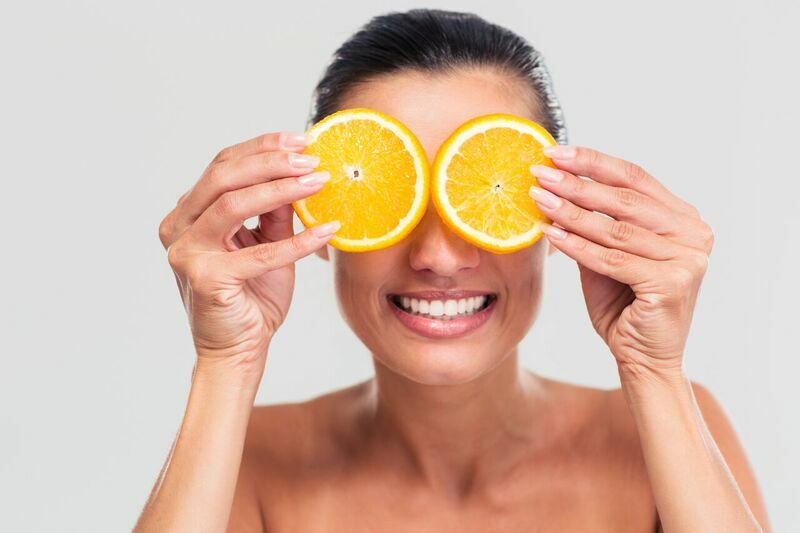 Read on to learn why Retinol, Vitamin C, and Hyaluronic Acid are the Three Amazing Amigos of Skincare. Retinol, for those of you new to Style Chicks, is one of our favorite beauty weapons. Retinol refines skin texture, it breaks up discoloration, it quells acne and reverses skin damage. 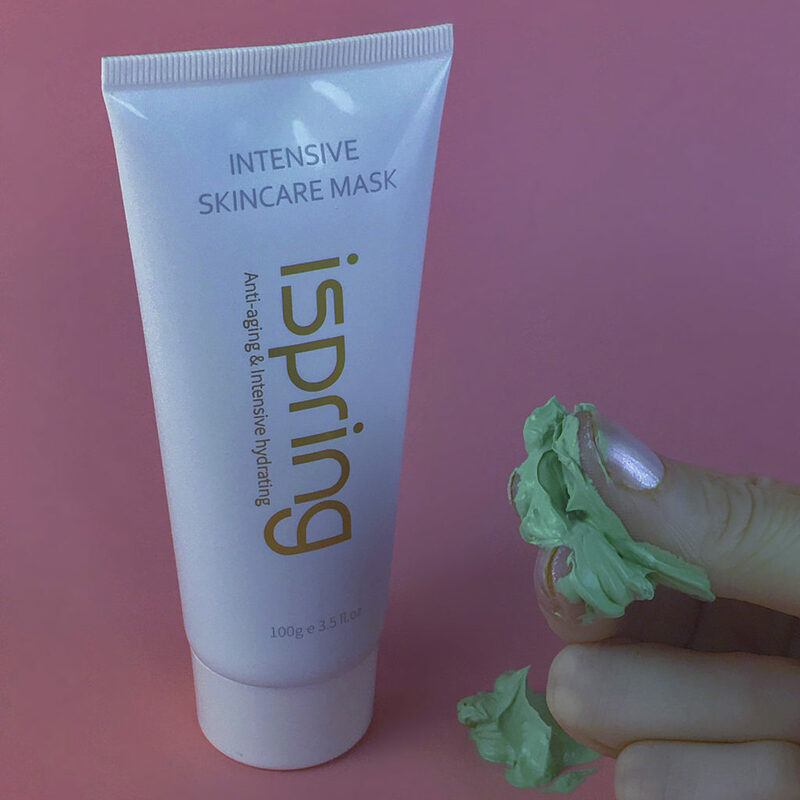 It eradicates dead skin like a slow-mo chemical peel leaving younger, dewy skin in its place. 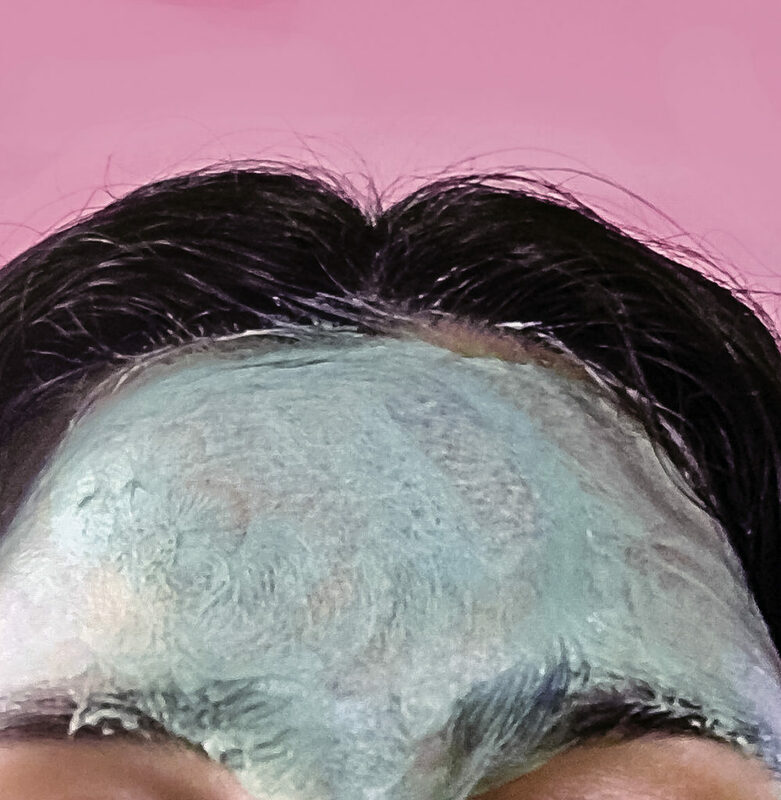 And as an unexpected bonus, blackheads practically leap out of your face and very few ever return because those pores are empty and stay empty. 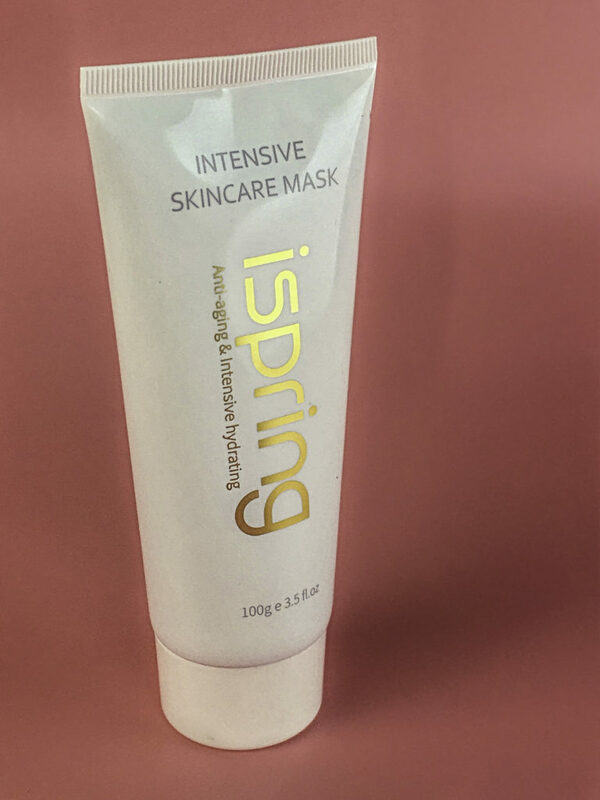 But there are two other active ingredients that when used in conjunction with Retinol can help it work even better, that being Vitamin C Serum and Hyaluronic Acid. Where Retinol tackles discoloration by breaking apart the dark pigment, Vitamin C fades any discoloration and does especially well on smaller specks of scars, age spots, and sun damage. Where Retinol refines the texture of skin so it looks strong, Vitamin C builds collagen to strengthen and support it so it is strong. 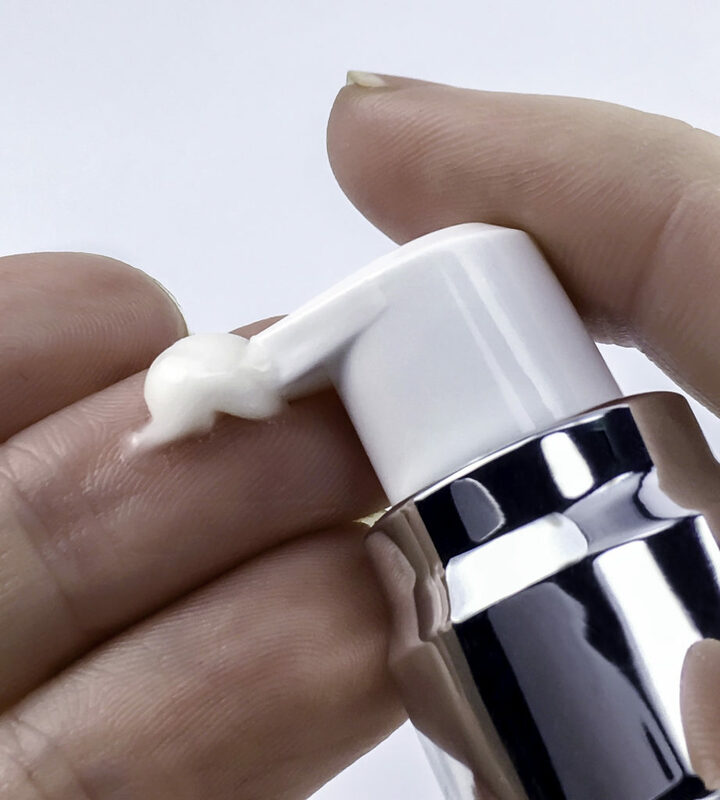 Retinol fights a pimple from happening by cleaning out pores and eradicating bacteria-trapping dead skin, Vitamin C reduces the inflammation that makes small blemishes into big ones. 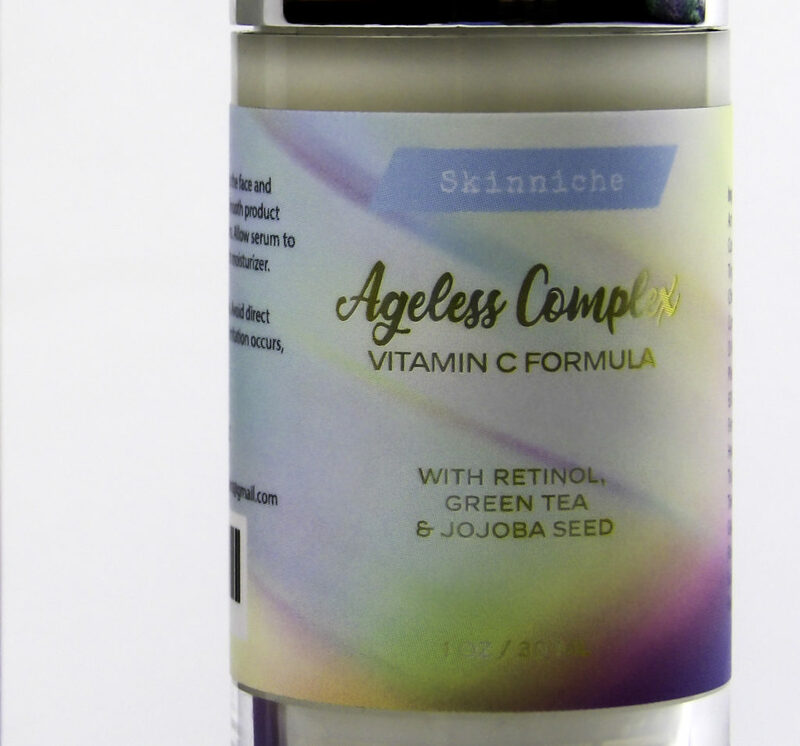 Both Retinol and Vitamin C help promote collagen, but each are involved at different stages in the collagen production process. 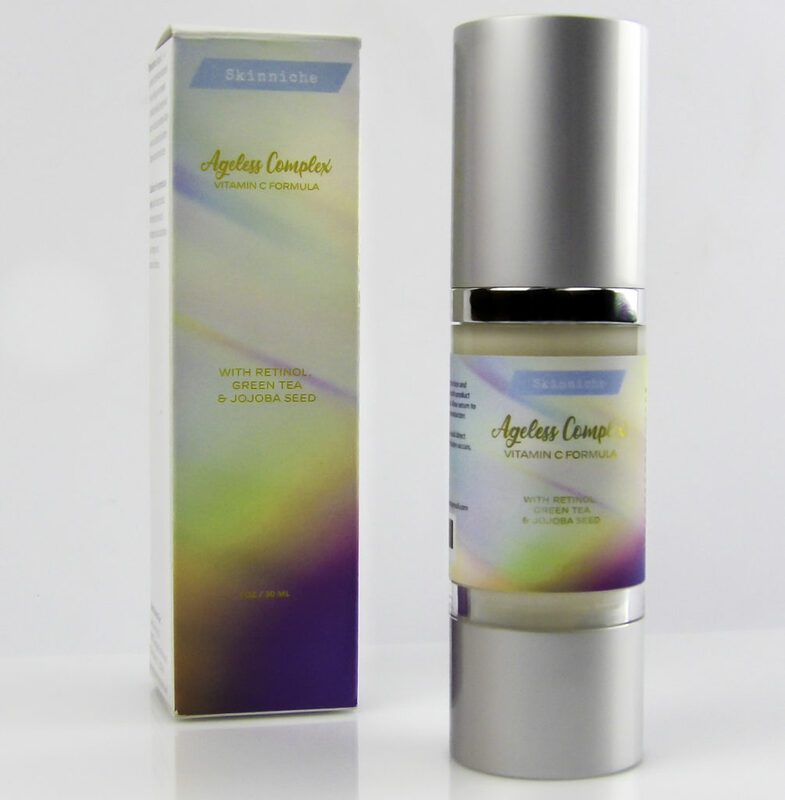 Together, they ensure the maximum amount of collagen is produced. The point of all this is these two ingredients accomplish the same end result, but in ways that the other one can’t. And together, they really get things done well. What a team! 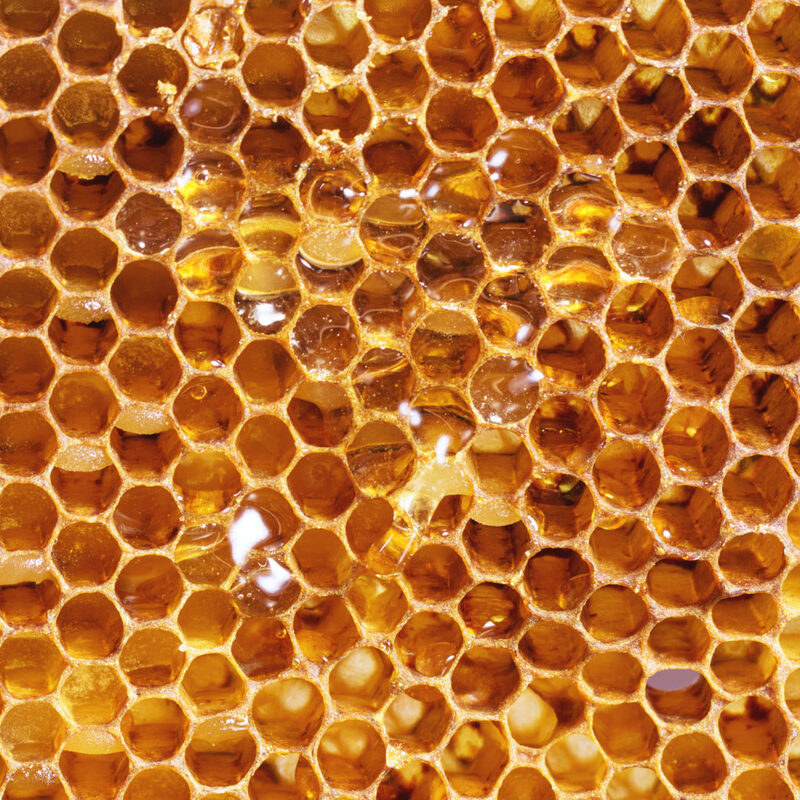 Retinol quickly exfoliates and resurfaces the top layers of the skin. After a few weeks, many of us make the same mistake: “If a little Retinol is good, then MORE will be better!” Then the redness and irritation come. Applying a larger amount Retinol won’t get it deeper into your skin, it can only burn the surface layers. But when Retinol is paired with Hyaluronic Acid, it can reach deeper layers of the skin. Hyaluronic Acid is another Style Chicks favorite ingredient because it has the unique capability to absorb enough moisture to plump the skin. 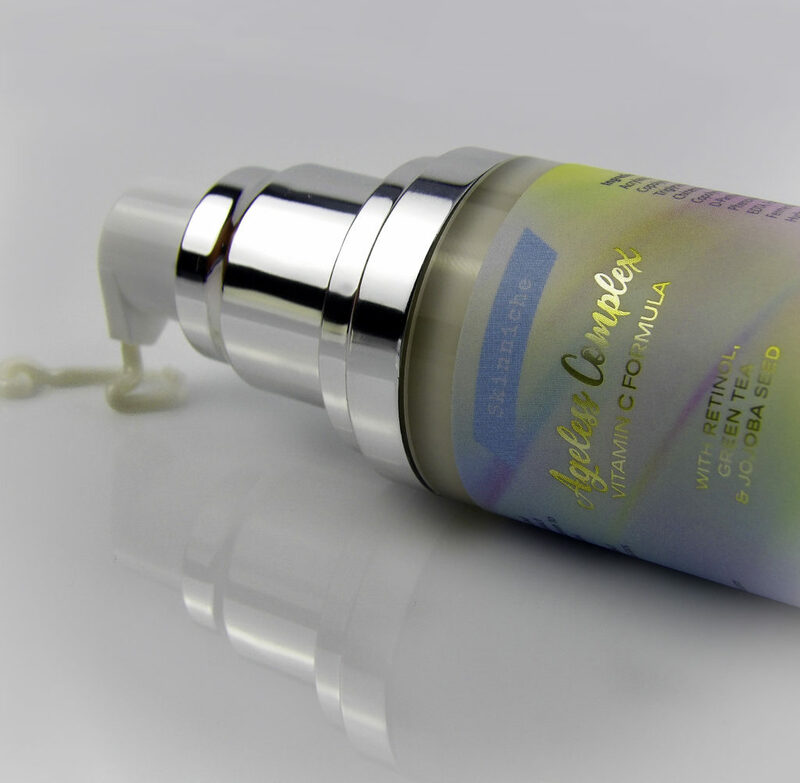 It also is a small enough molecule that it can penetrate deeper skin layers. 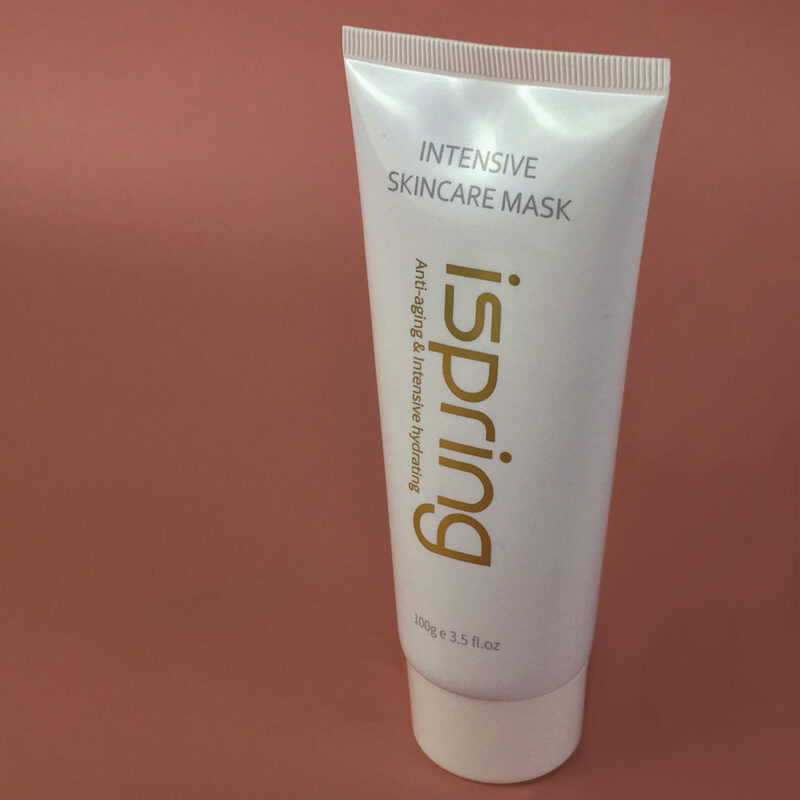 This means any active ingredient, like Retinol and Vitamin C, when paired with Hyaluronic Acid can slip into these deep skin layers like it has a guest VIP pass, meaning Retinol paired with Hyaluronic Acid can tackle even very deep, old scars and sun-damaged layers of skin. The deeper these ingredients get, the better the supporting collagen structure becomes, and even older and darker scars fade. When Hyaluronic Acid helps Retinol sink into the deeper skin layers, it helps eradicate uneven skin texture and tone, including sun damage and deep scars. TIP: If you have acne, old scars, sun damage or wrinkles that even glycolic peels do not make a major dent into, then the damage is deep in the skin and a Hyaluronic/Retinol combo can be very helpful to your type of skin problems. You can purchase Hyaluronic Acid and Retinol separately and apply them both at the same time, or you can use a Retinol that already contains Hyaluronic Acid, such as Lordsbury Retinol+C Cream Moisturizer. 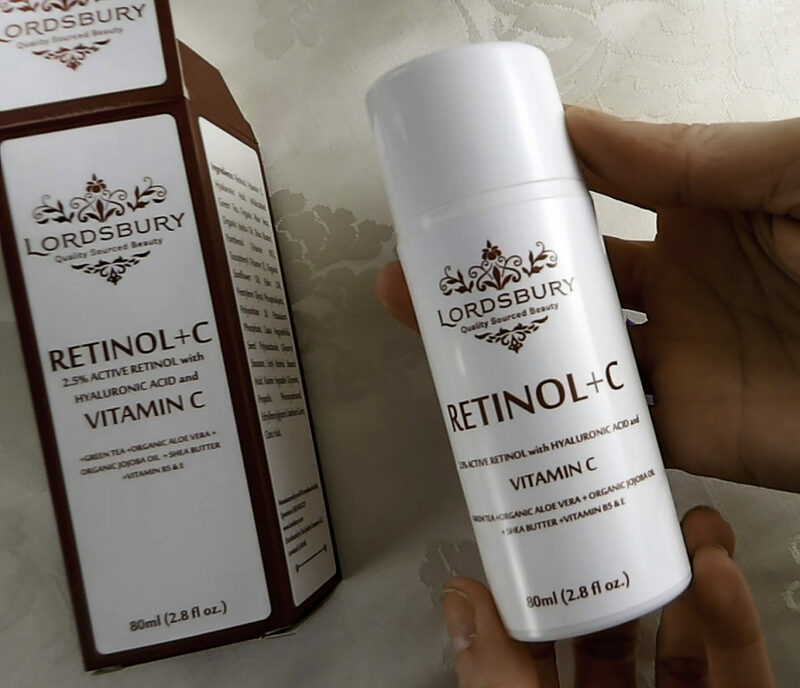 I also prefer Lordsbury Retinol+C Cream because all of us are tempted from time to time to slather on a bit too much Retinol, and since Lordsbury+C Cream Moisturizer has so many buffering emollient ingredients, it’s almost impossible to over-do it. Whereas with a prescription Retinol, it’s very easy to irritate the skin. My dermatologist told me that especially for skin over 30, the standard is Vitamin C during the day and Retinol at night, and apply a moisturizer on top, plus eye cream. This combo is effective but somewhat drying, and it is time-consuming to have so many layers of product. I found it far most cost-effective and practical to just apply one product, Lordsbury Retinol+C Cream Moisturizer, which contains 2.5% Retinol, 20% Vitamin C Serum, Hyaluronic Acid, and a host of buffering moisturizers to tolerate the potent ingredients, including Wildcrafted Green Tea, Jojoba Oil, Sunflower Oil, Shea Butter, and Aloe Vera. These buffering moisturizers enable me to even use it even around my delicate eye area and throat twice a day. 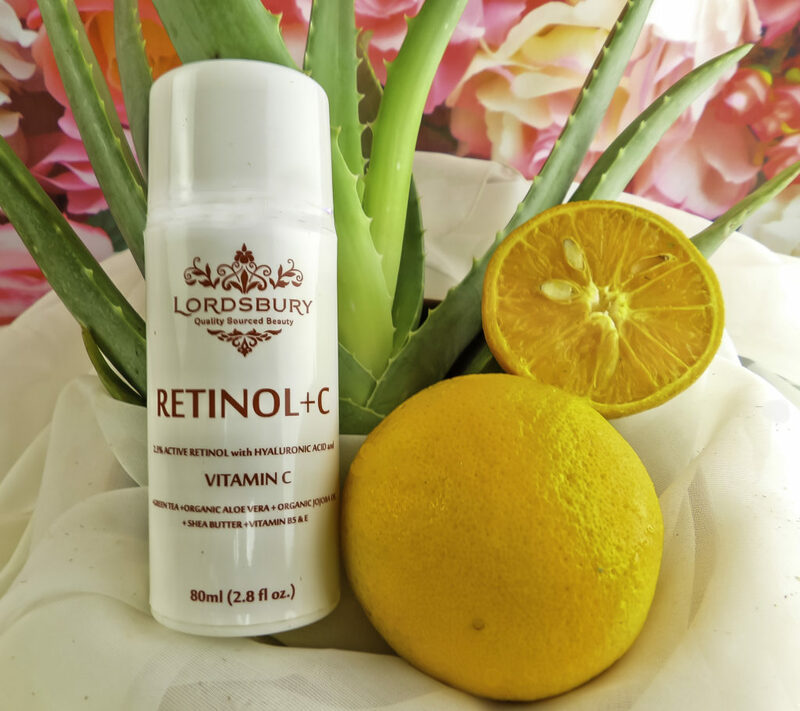 One pump of Lordsbury Retinol+C Cream Moisturizer is all you need for face and eyes to get a prescription strength Retinol, 20% Vitamin C, Hyaluronic Acid to make it work overtime, and a host of moisturizers that even buffer the delicate eye area from irritation. Retinol can work wonders, but Vitamin C and Hyaluronic Acid can make a good thing even better by perfecting the tasks Retinol does well and enabling Retinol to access the deeper skin layers where old scars and sun damage may lurk. 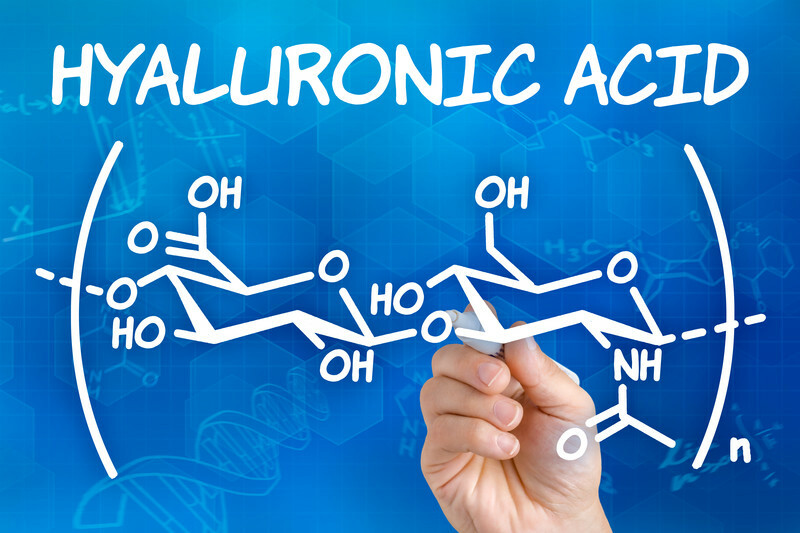 Hyaluronic Acid also helps Vitamin C and Retinol produce collagen at the deeper layers of the skin, which enables better support against wrinkles and sagging. 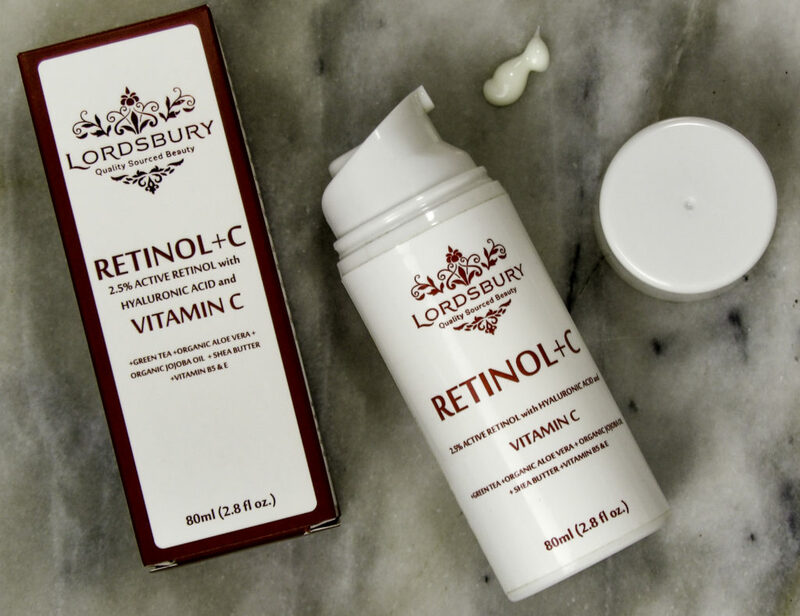 Lordsbury Retinol+C combines all three ingredients together with many natural, soothing moisturizers, for a one-stop, all-in-one moisturizing treatment trifecta. 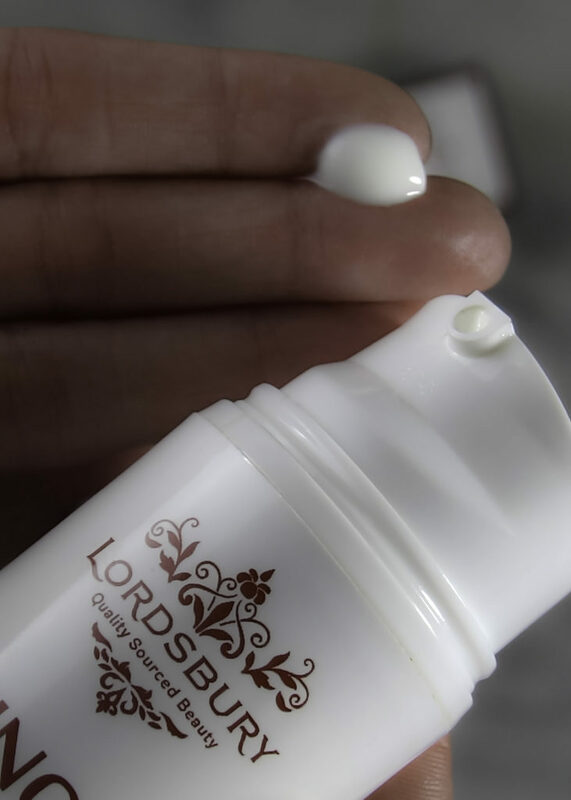 Style Chicks previously posted about our experience using Lordsbury Retinol+C Cream Moisturizer, and today we are giving a one month update on the Lordsbury Retinol experience so far. I’ve been using Lordsbury Retinol+C Cream Moisturizer twice a day for about a month now, and my skin’s brighter and the texture has become more refined. 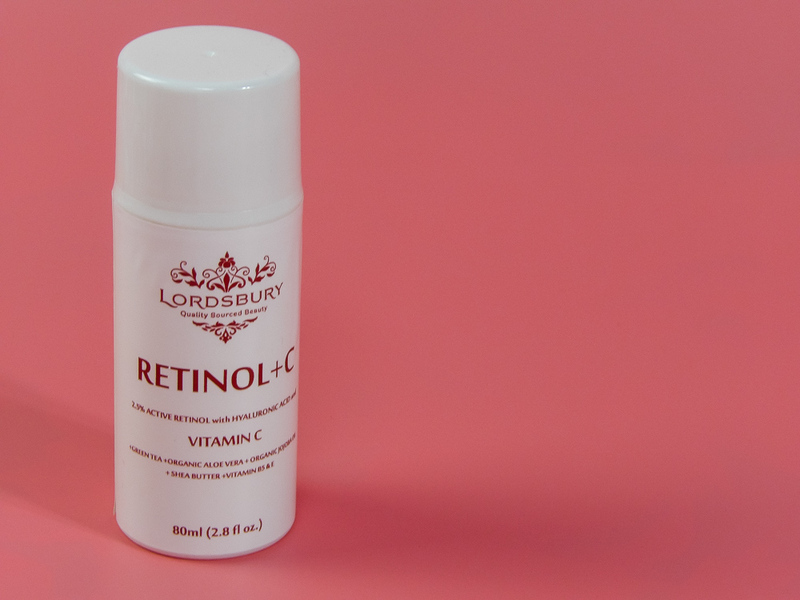 Lordsbury Retinol+C Cream Moisturizer’s Vitamin C and Retinol combination causes rapid dead skin turnover, and always leaves skin so soft, like after exfoliating. I’m very pleased starting the process of building more collagen. I find my skin to be soft and supple, even with twice a day Retinol use. 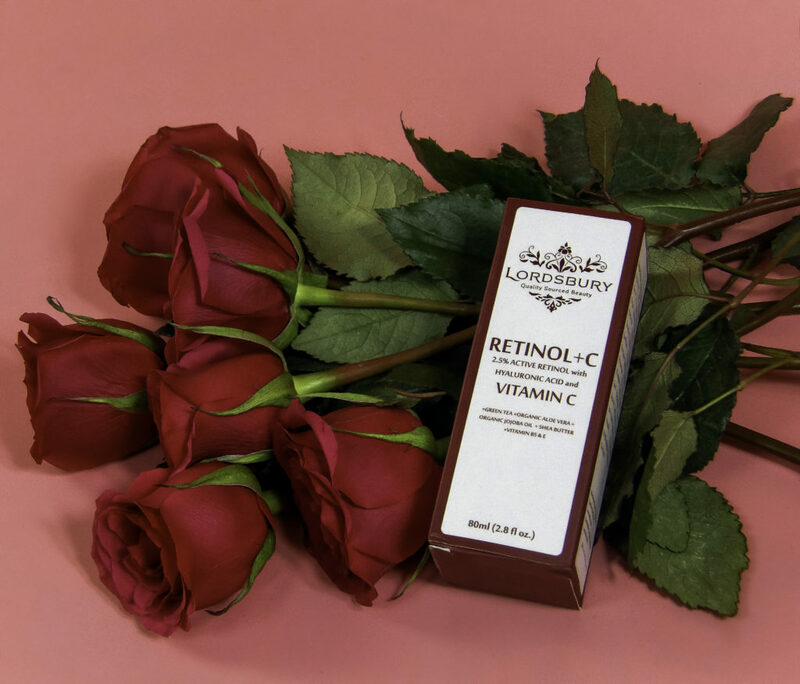 If you haven’t used a Retinol product before, or have used a prescription level Retinol but your skin got too dry, red or irritated, then Lordsbury Retinol+C Cream Moisturizer is something to consider. I’m delighted to find a viable 2.5% pure retinol cream for sensitive skin. I’ve used a prescription 2.5% Retinol before and got red and dry, so I credit Lordsbury’s soothing and hydrating ingredients for tolerating twice a day use, even around the delicate eye area. 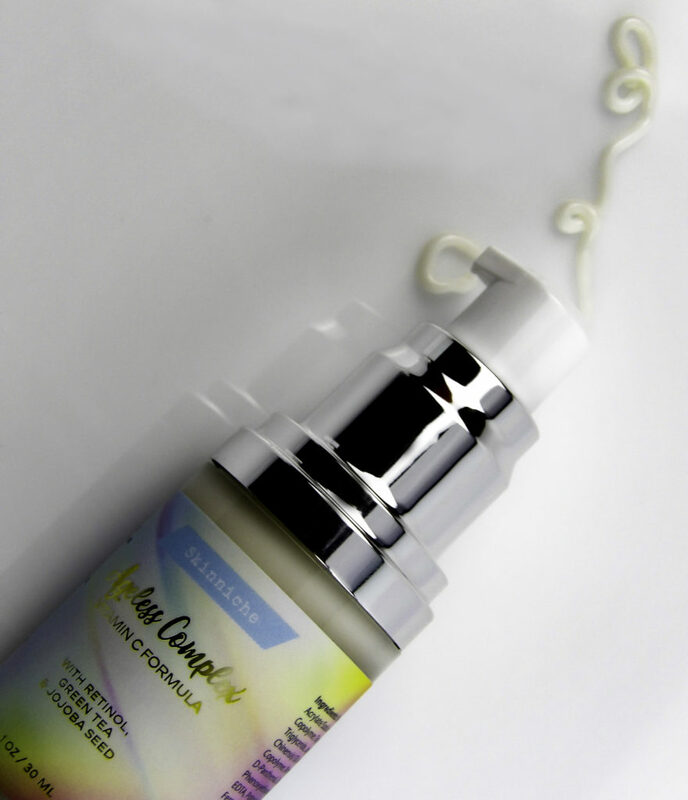 The organic ingredients like Jojoba, Aloe Vera, Green Tea, Sunflower Oil and Shea Butter enable even sensitive skins to tolerate this 2.5% Pure Retinol with Vitamin C, Hyaluronic Acid, Vitamins B5 and E. A powerful cocktail of all the beauty all-stars in skincare. The surface of the skin feels and looks more refined and even. The combination of Vitamin C and Retinol lead to rapid dead skin turnover, leaving skin soft to the touch, like after a gentle exfoliation. 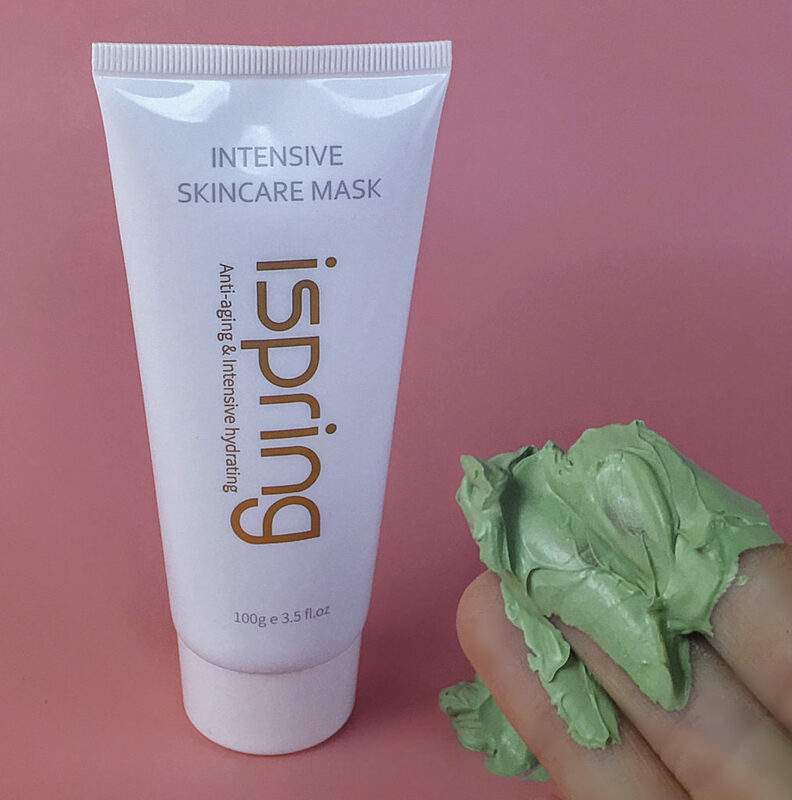 Something I particularly like is that dry skin sloughs off easily when washing my face without tell-tale peeling or redness, and with no flaky skin during the day, my complexion always appears smooth. I’m particularly pleased with how my undereye area is tolerating the Retinol and Vitamin C combo. EIGHT DAY MARK: PIMPLE PURGE! About a week or so into daily Retinol use, some people, including myself, break out in whiteheads and blackheads all of a sudden. 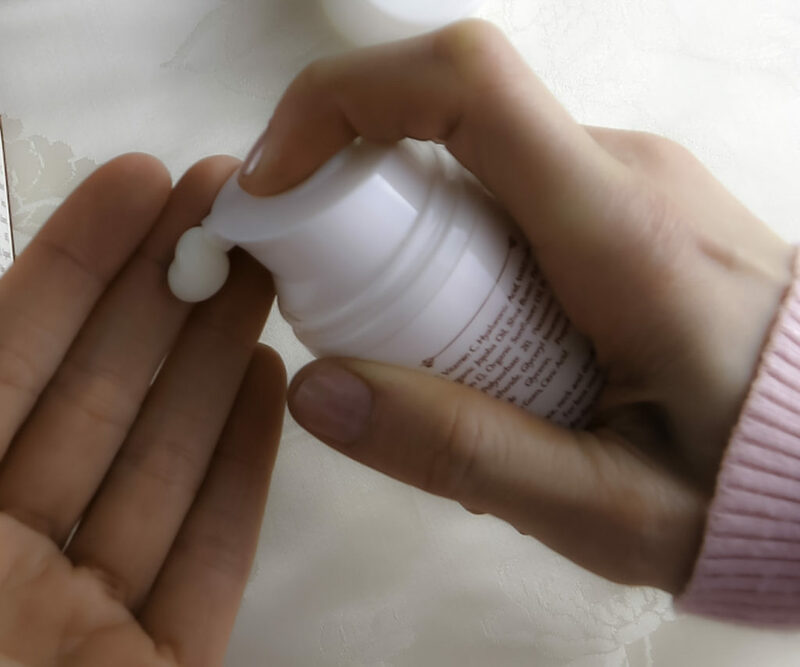 The purging of clogged pores when starting any Retinol is normal, even prescription Retinol. It lasted a week and then my skin was much less congested than before. 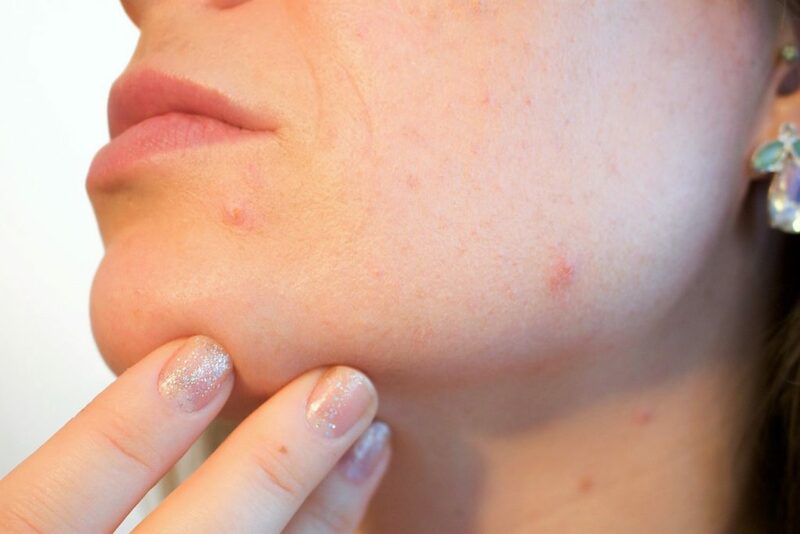 If this happens to you, don’t be discouraged, your skin will briefly breakout while your pores are purging, then suddenly, about a week or so later, skin is clear. I didn’t realize how much sebum and latent clogging I had in my pores, and tiny whitehead type bumps just under the skin surface that came and went all at once. If you have a problem with acne, over time, Retinol is highly effective in removing the dead skin cells that trap oil, sebum, and bacteria into a pimple. 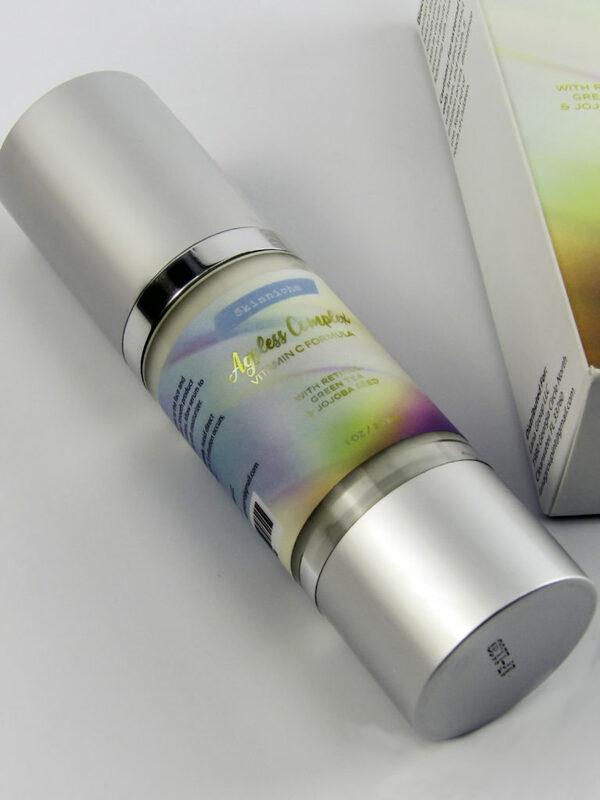 No dead skin cells mean better control over acne after the first few weeks. So if you are an adult acne suffer, just hang in there! 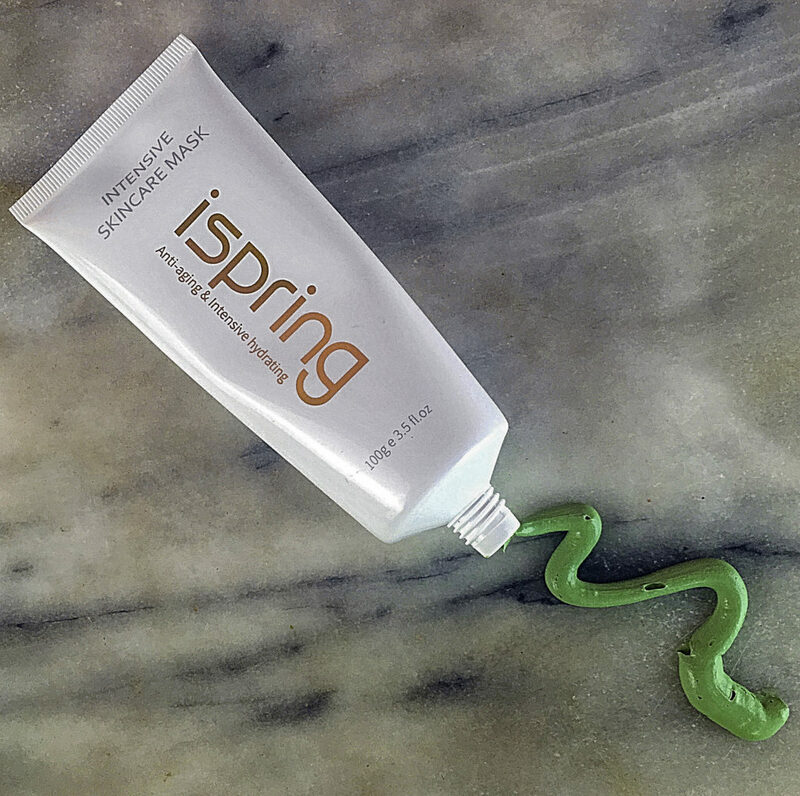 TIP: Don’t start a retinol product only 2-3 weeks before a big event that you want clear, glowing skin. Give yourself 4-5 weeks of Retinol use before an event or photo so the retinol has time to work and leave you blemish-free. I saw my Dermatologist about two-thirds through the 30-day Lordsbury Retinol+C Cream Moisturizer update. 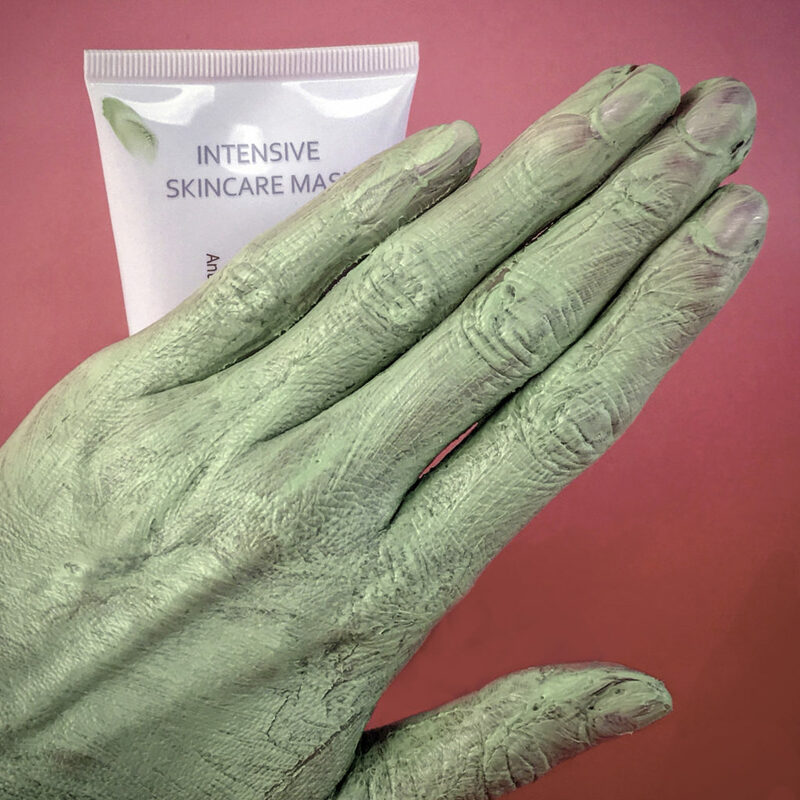 I love my derm, she maintains offices on both coasts and tells me about all the latest in prescription skincare and I tell her about my favorite over the counter skin care products. She walked in and immediately said “What are you using on your skin? It looks great!” and she began to inspect my face. When I made the appointment months before, I planned to ask for a prescription for Renova, the emollient version of Retinol for my undereye area. 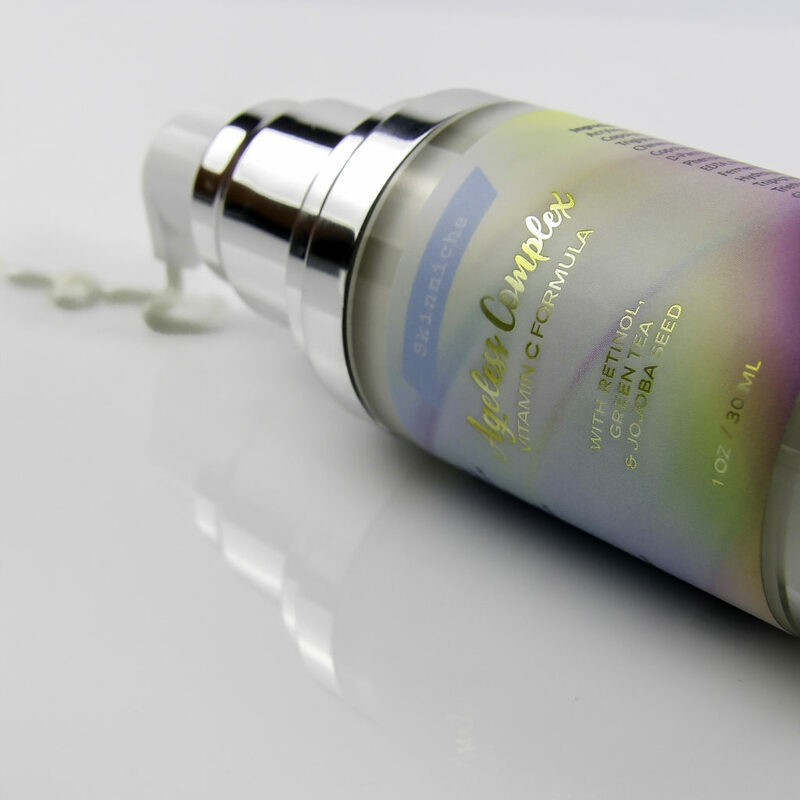 But we decided against it because the Lordsbury Retinol+C Cream Moisturizer was working on my undereye area for discoloration, fine lines, and crow’s feet, and I didn’t have any irritation around the eyes that can occur with prescription retinol. She told me exactly where to apply it for best undereye results: follow the line of the orbital bone, and stay away from the lash line and the bulge under your eye. 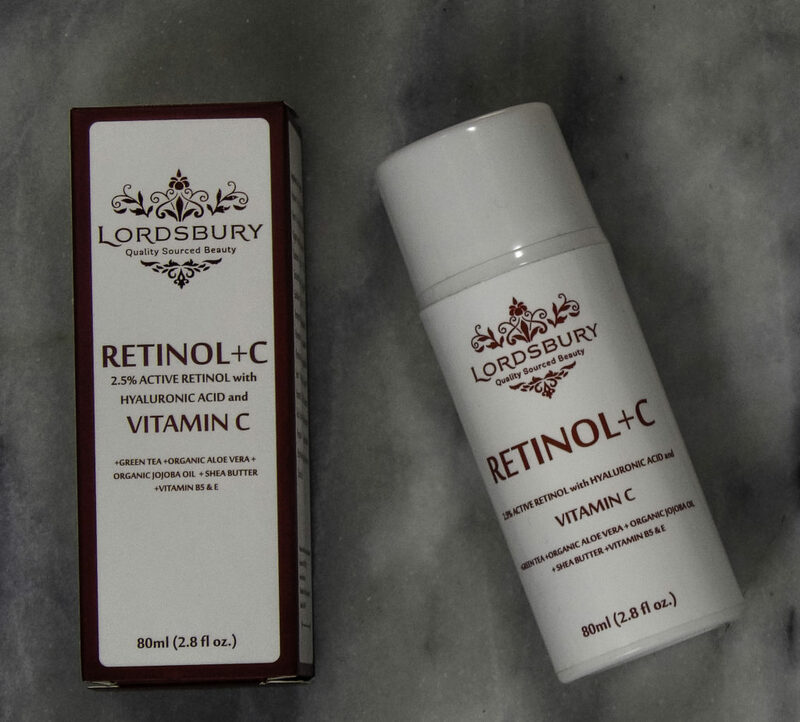 Normally my dermatologist will extract any pimples or whiteheads on my appointments, but she said nothing was bad enough to extract, it was better to keep using the Lordsbury Retinol+C on a few whiteheads and they would purge on their own, which in a few weeks, they did. I left her office feeling like a pretty, pretty princess. Now that warmer weather is coming, I am focusing on the skin on my shoulders, upper arms, throat, and decolletage as well as my face. 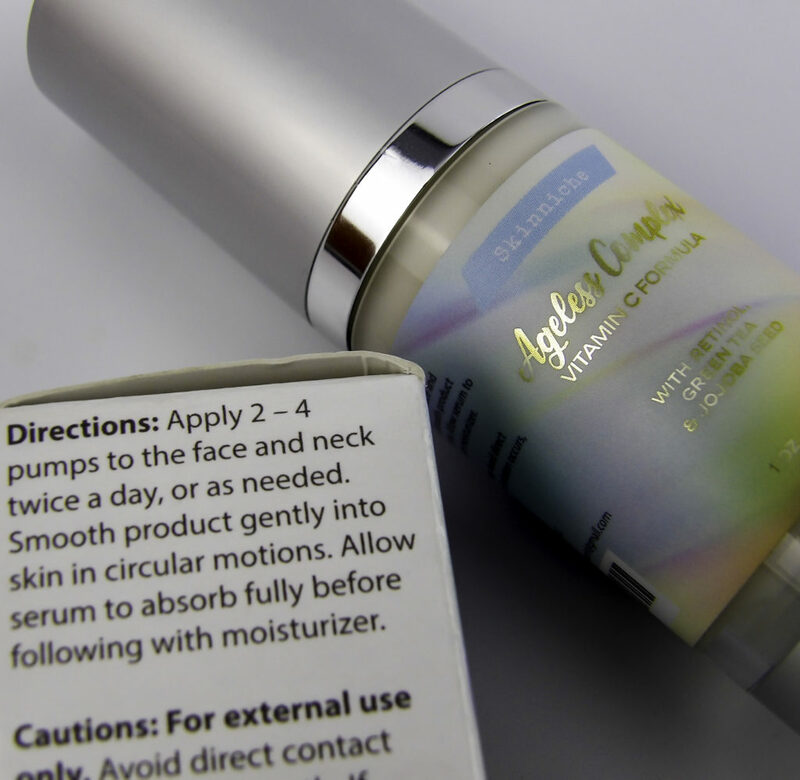 These areas respond very quickly, especially in improved texture, discoloration, and fine lines. Areas of sun damage start to improve in texture but will take a bit longer. TIP: Remember to wear sunscreen anywhere you use Retinol and Vitamin C, even on cloudy days! The fine lines on my under eyes and my eleven lines look smoother to me, more like how I look immediately after an at-home AHA peel. The lines are not gone, but they are not so obvious on bare skin anymore. Collagen production generally takes closer to eight weeks, so I would not expect to see a dramatic lift to my eye area yet, but since I can tolerate this cream around my eyes twice a day, I am hopeful. My Crow’s feet look smoother. Collagen production takes at least eight weeks to show, so I don’t expect a visible eye area lift yet. But since I tolerate Lordsbury Retinol+C Cream around the eye so well, I’m hopeful! 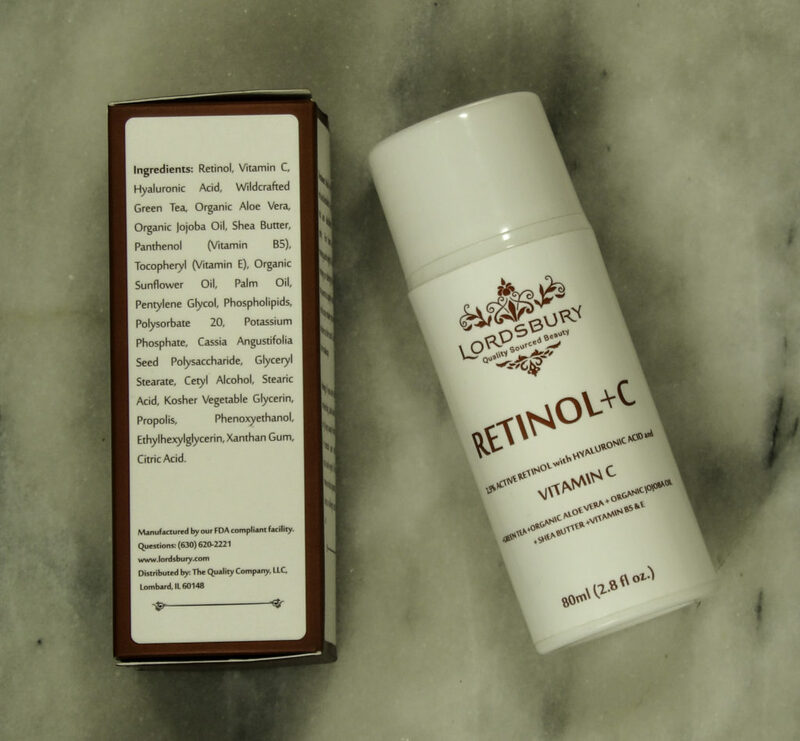 FAQ: HOW DOES Lordsbury Retinol+C Cream Moisturizer COMPARE TO A PRESCRIPTION RETINOL? I like having Retinol and Vitamin C and moisturizing ingredients like Hyaluronic Acid all in one cream. A prescription can give you a 2.5% to 5% retinol dose, the Lordsbury Retinol+C Cream Moisturizer is 2.5% pure retinol, so it is within the range of a prescription dosage. 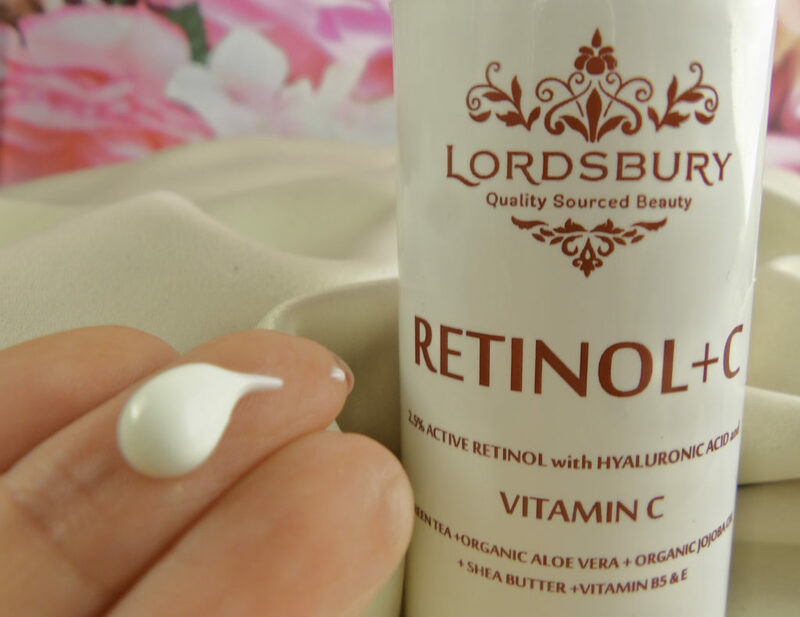 What is preferable to Lordsbury Retinol+C Cream Moisturizer over prescription retinol is that prescription retinol is very drying, skin gets red and flaky. 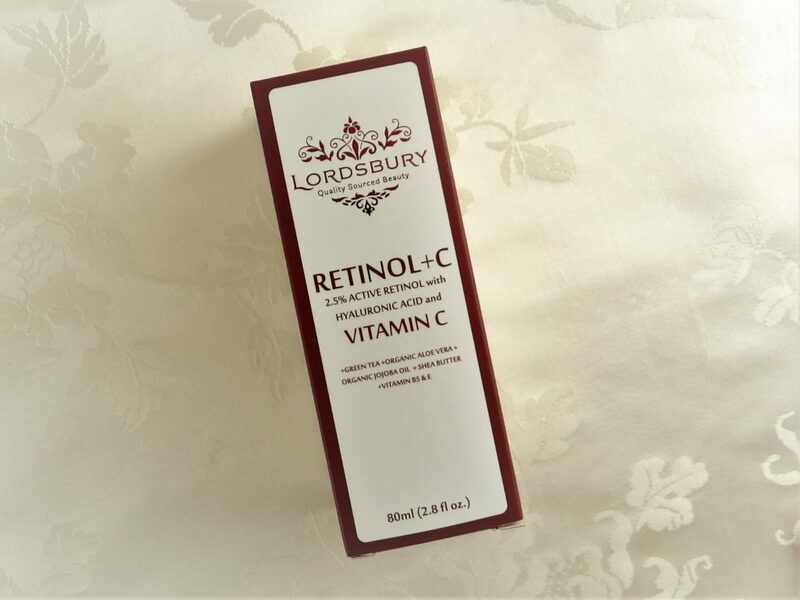 I like being able to use Lordsbury Retinol+C Cream on delicate skin areas like my eye area, throat, hands, and decolletage. 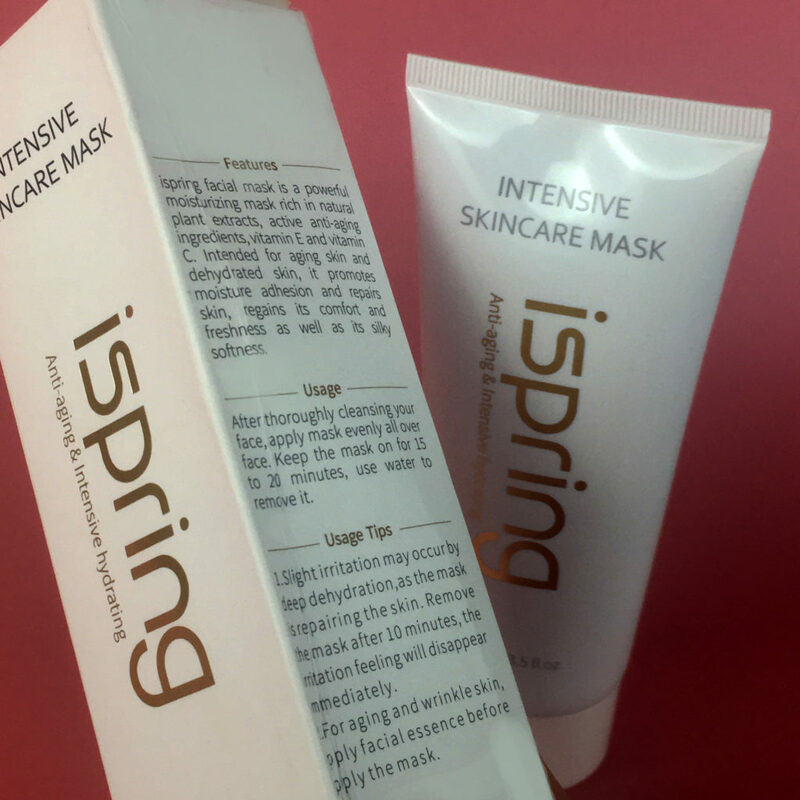 It can be used without irritation or peeling, even around delicate skin areas like the eyes and mouth. The container is also huge, and it only takes a pea size amount to cover my face, two peas for face and throat. If you are a teenager with current acne breakouts, you could likely benefit from a Vitamin C and Retinol combo, as Vitamin C can fade acne scars. Some may just prefer the extra strength Retinol of 5% that is only obtained from a prescription, and the Retinol and Vitamin C for collagen building combo may be less of a concern for teens (for now). If you are in your mid-twenties and older, collagen conservation and collagen production become a beauty goal, and Lordsbury Retinol+C cream moisturizer makes for a very gentle but effective combination of both these beauty-boosting ingredients. That’s the Lordsbury Retinol+C Cream Moisturizer one month report. I’m so pleased especially around the eye area, throat, decolletage, collarbone, and hands. I can’t wait to see in another month when the increased collagen production process starts to visibly show! 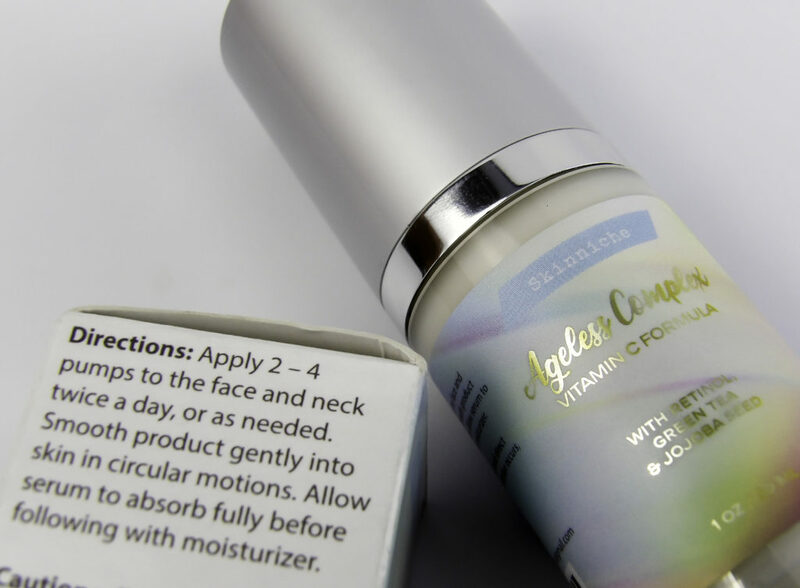 Style Chicks received Lordsbury Retinol+C Cream Moisturizer in exchange for our unbiased review and received compensation for our time and effort. However, our experience with the product and the opinions expressed in this review are 100% ours.